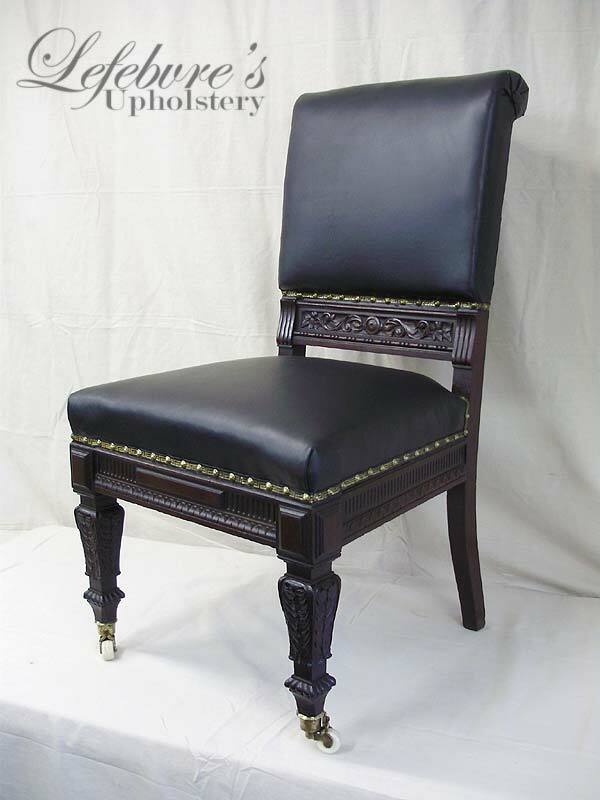 Here is a wonderful restoration of a very old Victorian chair. 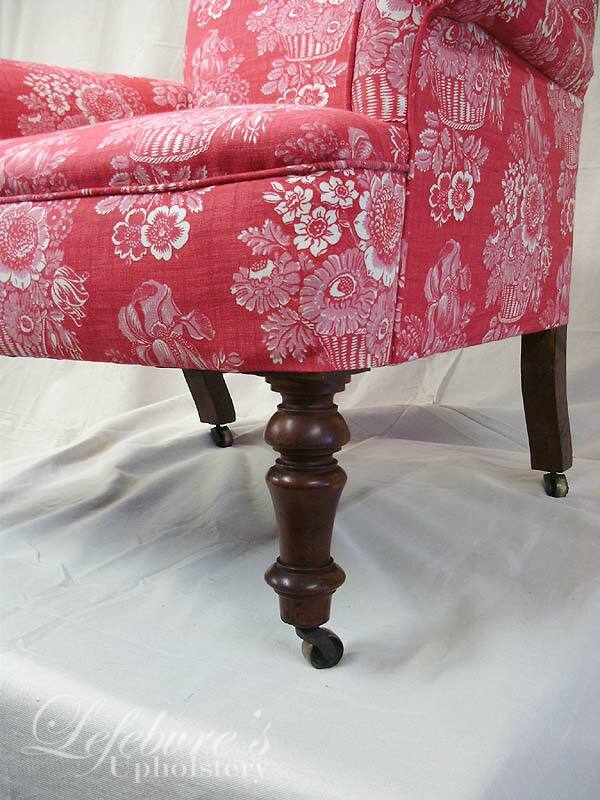 Note that this chair has beautiful turned walnut legs on original casters which were hidden with a skirt. 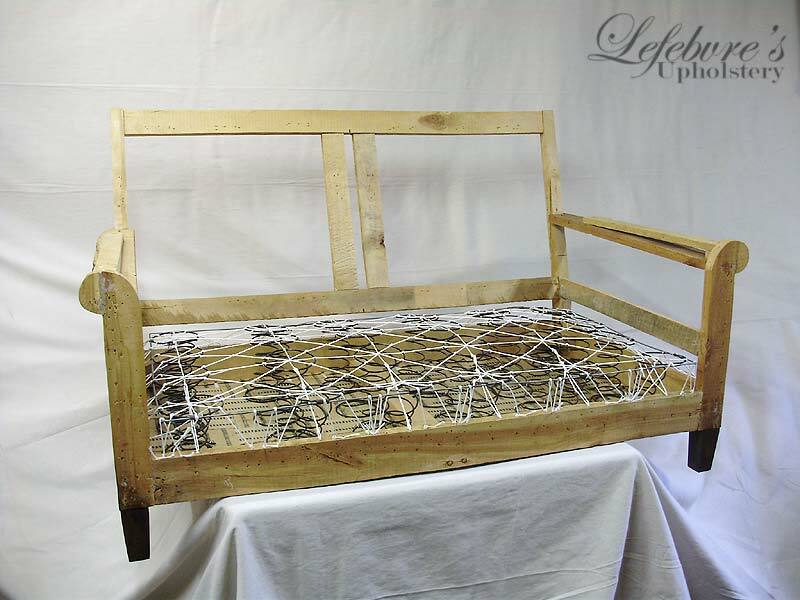 The chair frame and original webbing/springs needed a little bit of attention, but they were in overall good shape. We changed the style of the arm covers a little bit, and eliminated the skirt. 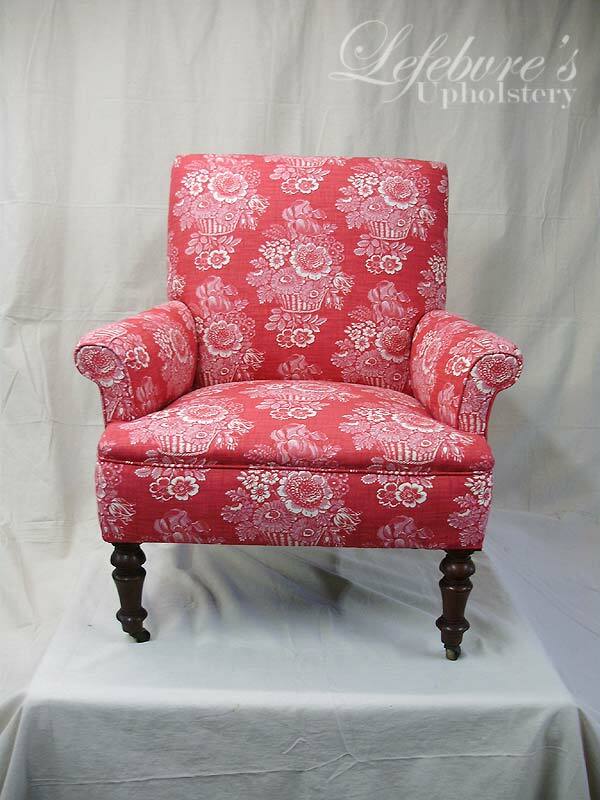 What a gorgeous chair! I'm in love with this one. It's such a fun piece now. 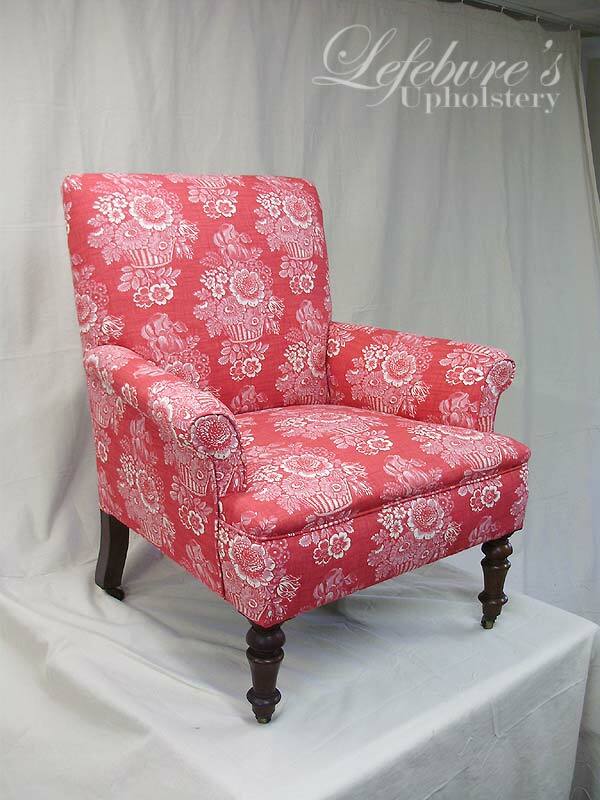 The fabric is a printed red cotton similar to a French toile. 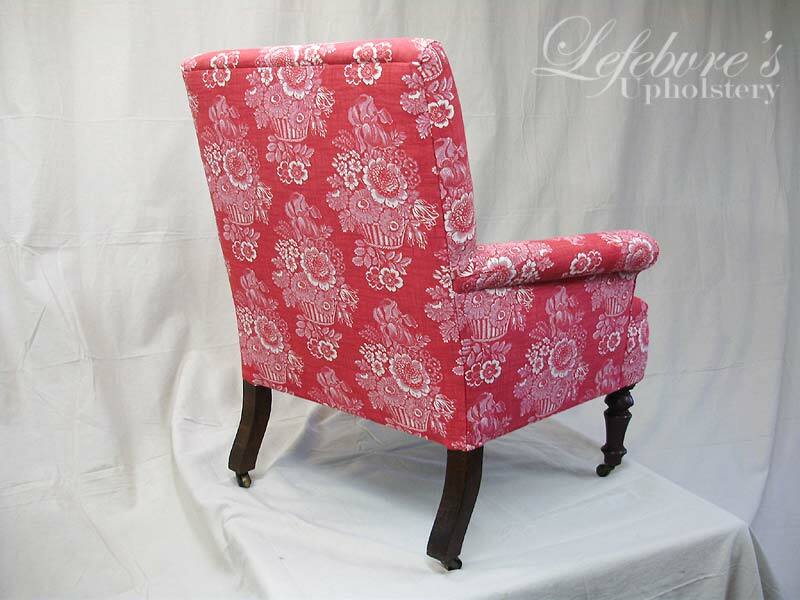 It was no surprise to see that the fabric is actually from France. 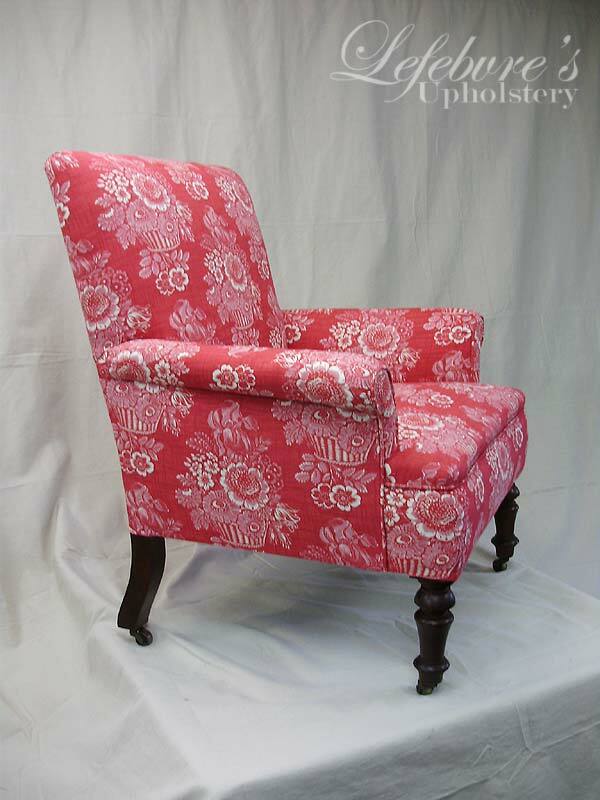 These chairs were an interesting project. 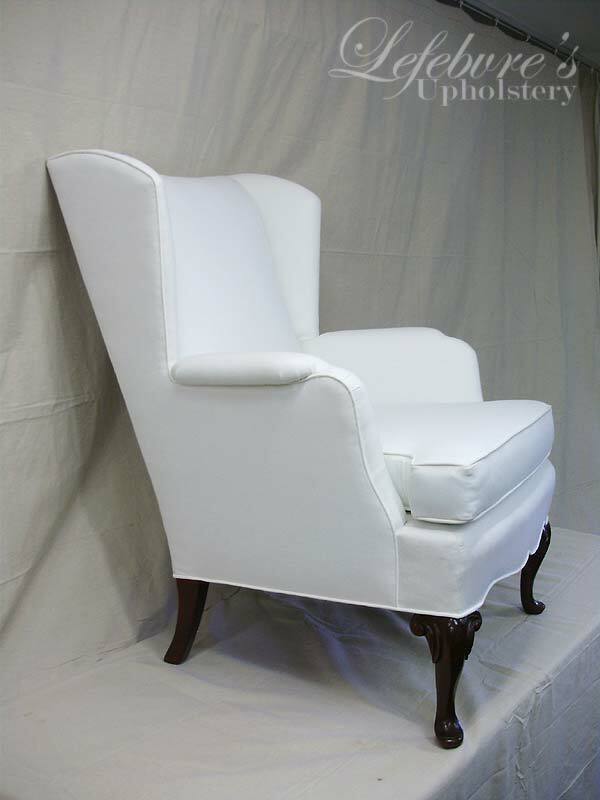 They are well made frames, but the style was a bit dated, and if you ask me, the tops reminded me a bit of a toddler's car seat, so Pierre suggested to the client that we could change the style of the chairs while reusing most of the existing padding/foam. 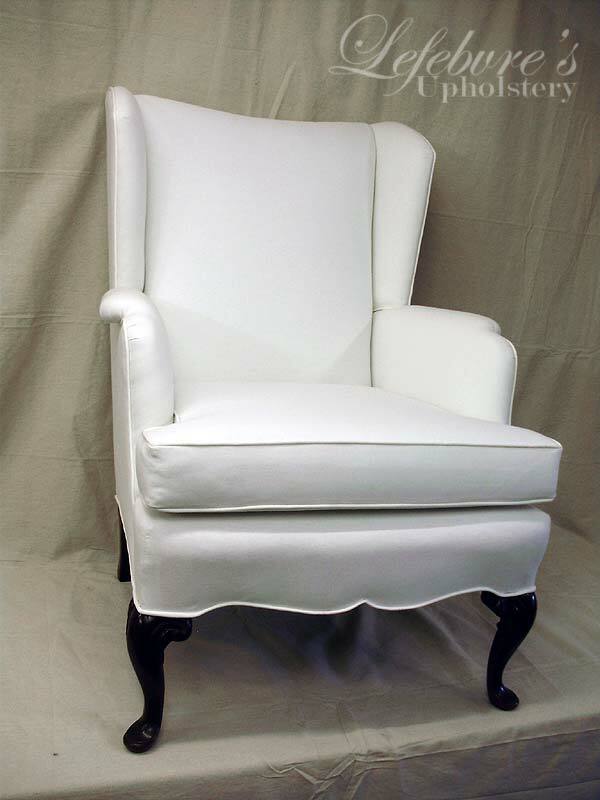 This would modernize the chair by making them into a more traditional shape (if that makes any sense). 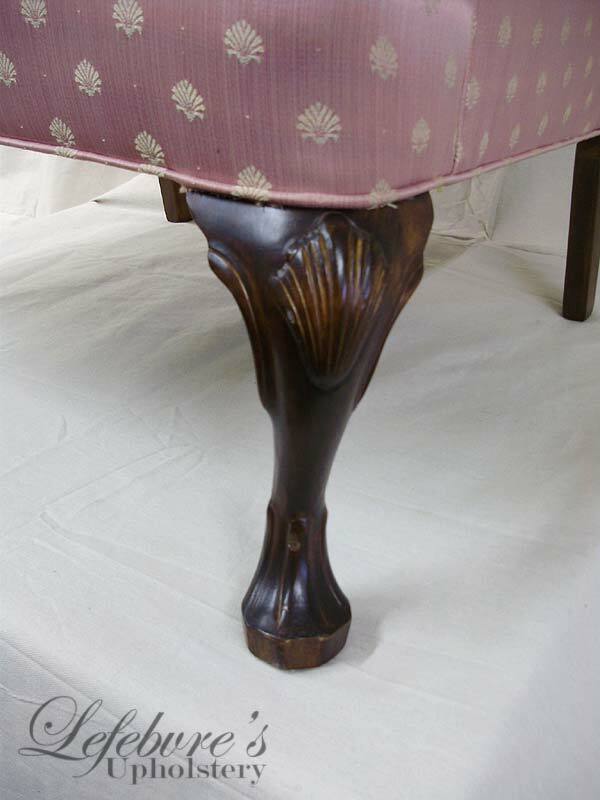 This set also had very interesting carved legs with sort-of a duck shaped foot, which I haven't seen before. 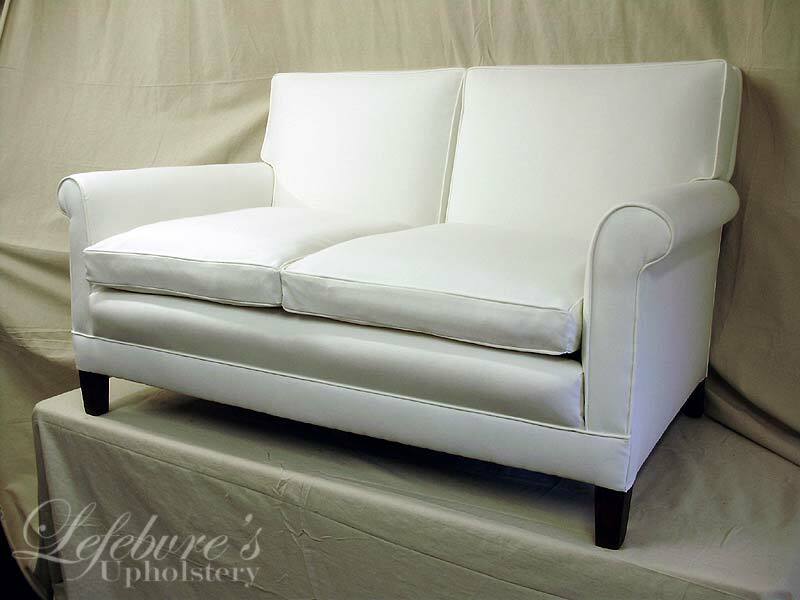 I think these turned out beautifully, and our client was very happy. 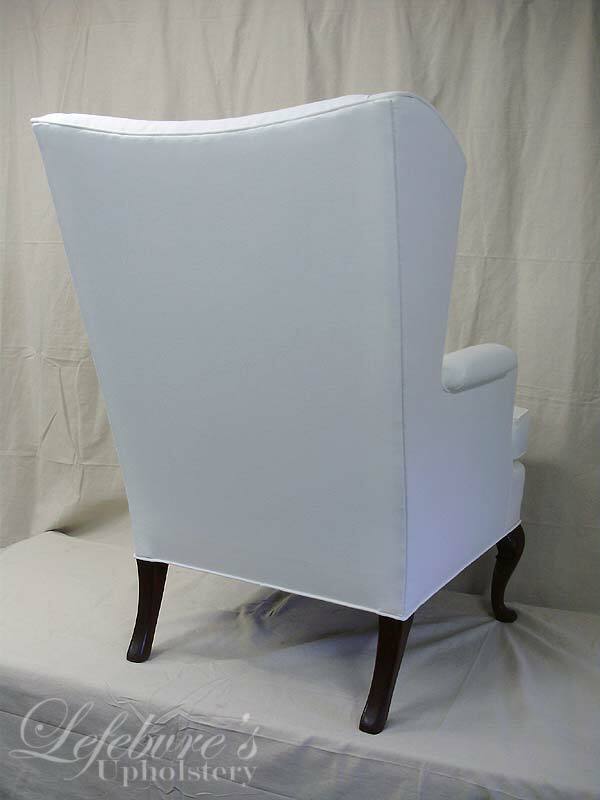 For the reconstruction, we had to redo the padding on the wings, and modify the padding on the arms. 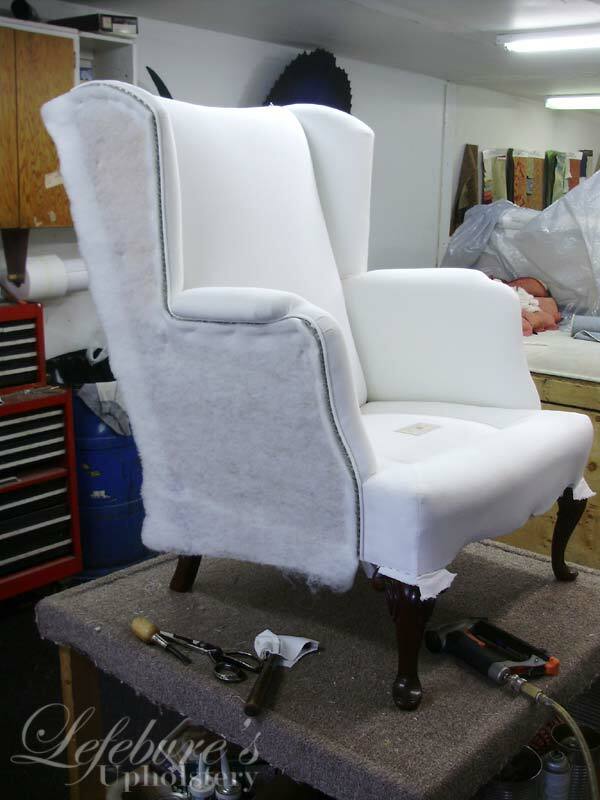 New facings (the arm end caps) were made, and the existing seat cushions were very worn, so new foam cushions were cut and fitted for the chairs. An additional side note: the fabric looks a bit like a faded denim, but it's actually more of a silky/high-end fabric, and it looks different up-close. 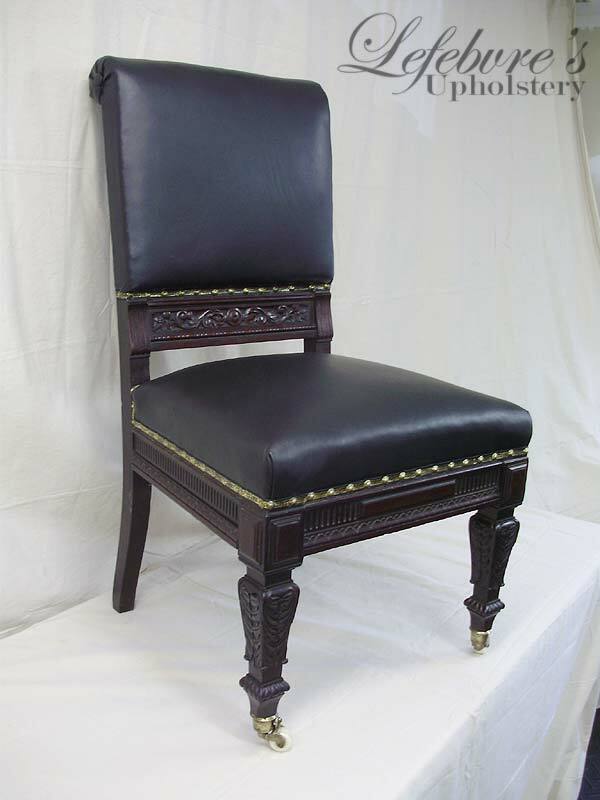 This was a stunning carved mahogany chair. The frame construction was massive and rock solid. 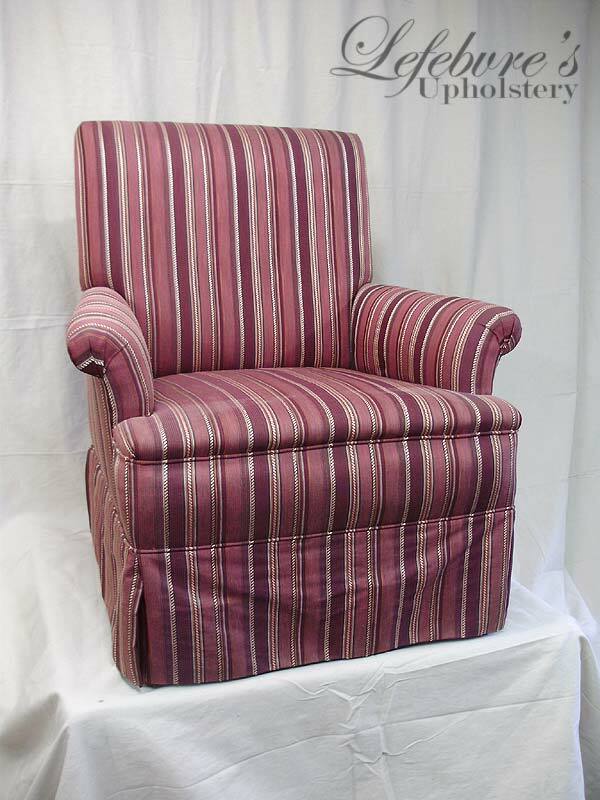 It came to us in rather poor shape, but with newly restored upholstery, and gentle cleaning, it's ready for another century of use. 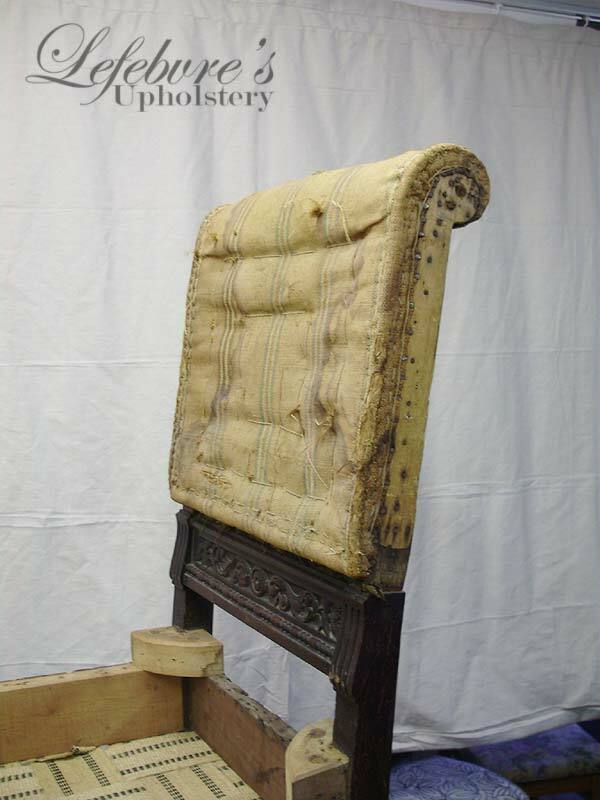 The original upholstery on the backrest is simply wonderful. 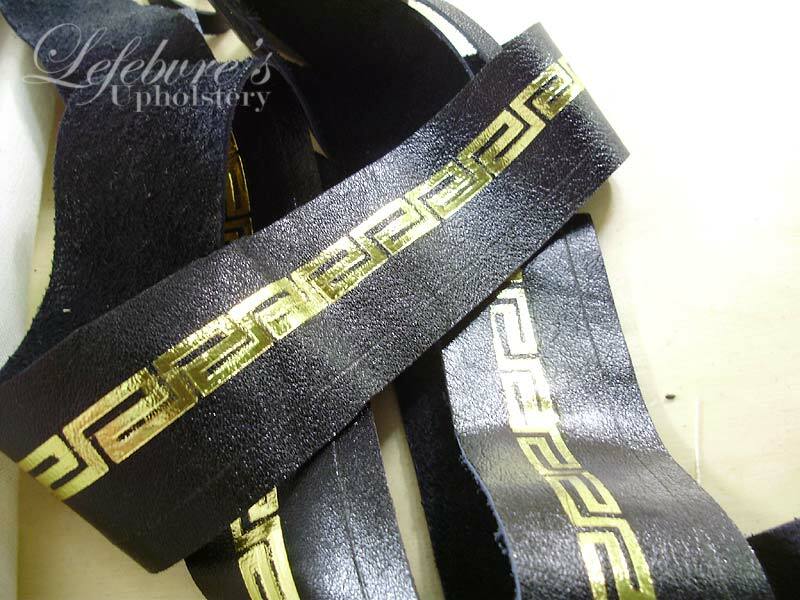 Look at the tightly stitched edges. 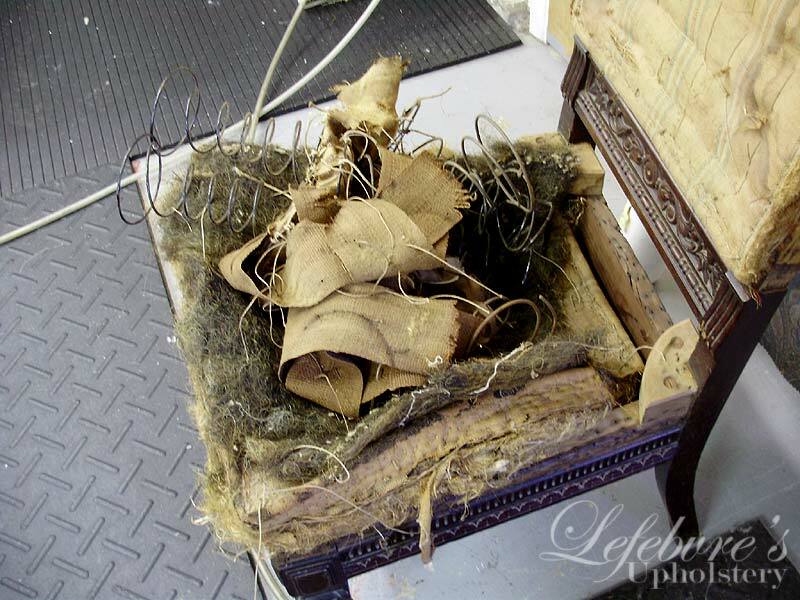 The original horsehair, stuffing, and coils before taking them apart and re-installing them in the chair. 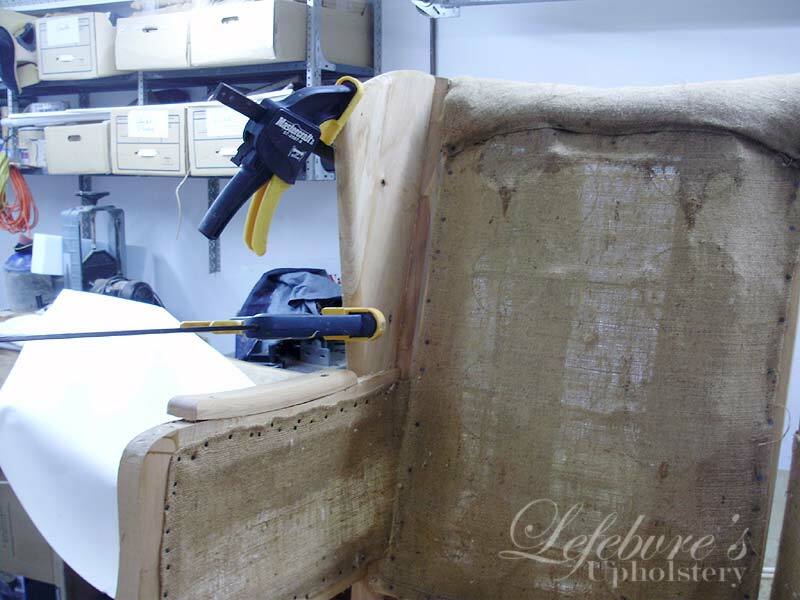 Restored "first stuffing" on the chair. Not shown (I forgot to take photos), the next step was the second stuffing, which is cotton, with a layer of muslin over it. 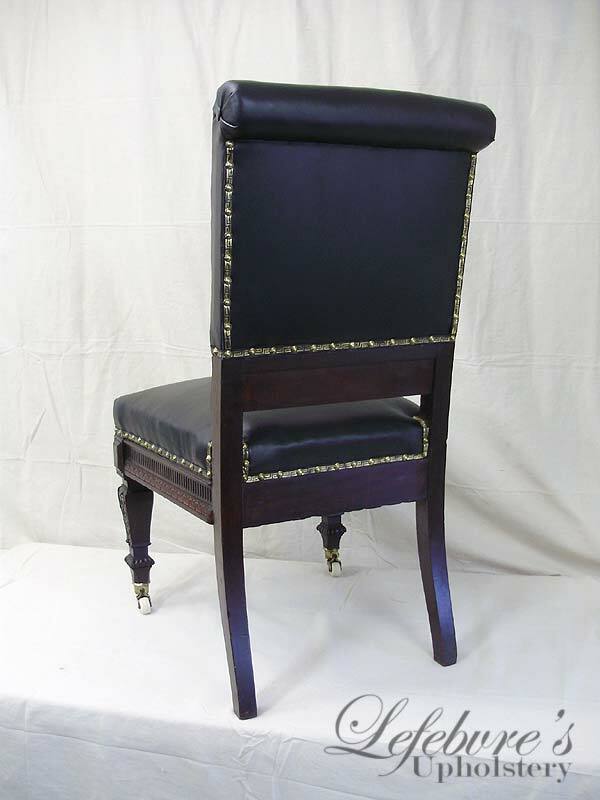 After this, the new leather, decorative gold-leaf edging, and ornate tacks. Gold leaf trim before attaching and antiquing. 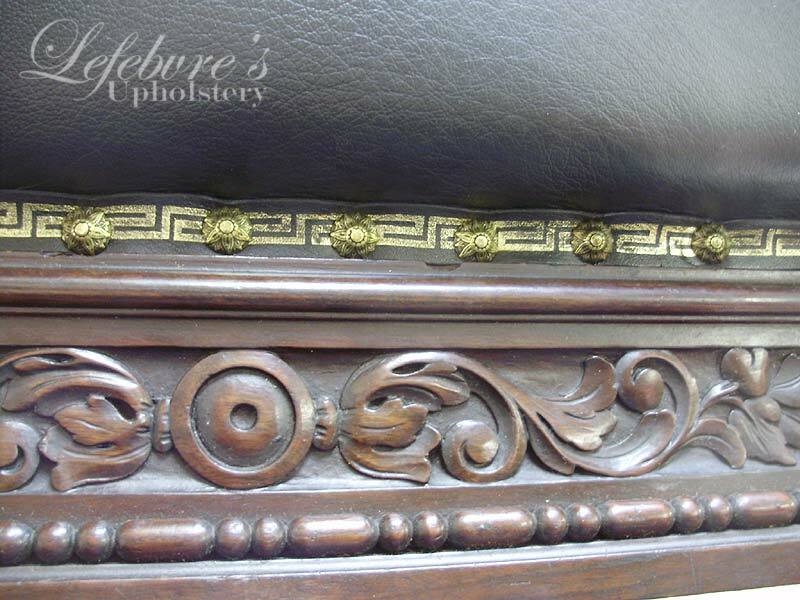 Detail of finished trim and carving. 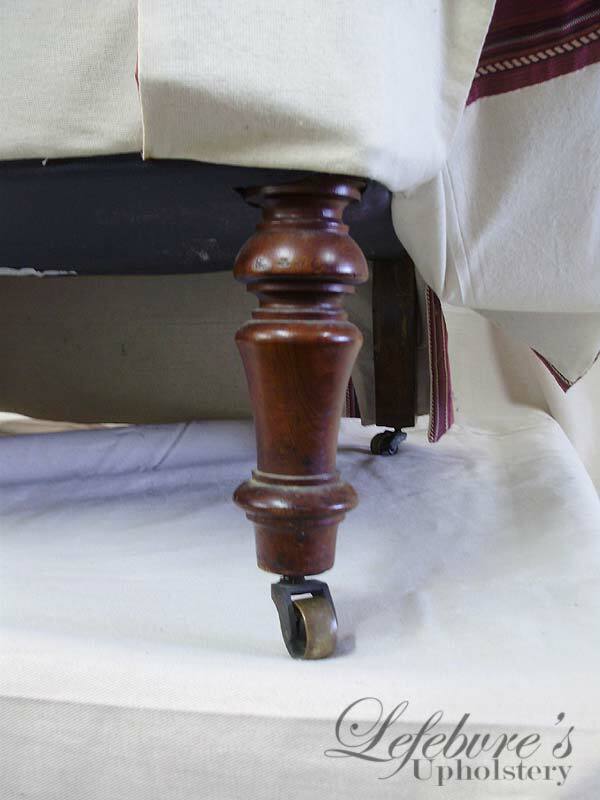 These casters are particularly interesting, and beautifully made. They have the words "Parry's Patent" written on the outer brass wheel, but we weren't able to find any information about them. The surface of the brass seems to have traces of gold plating. 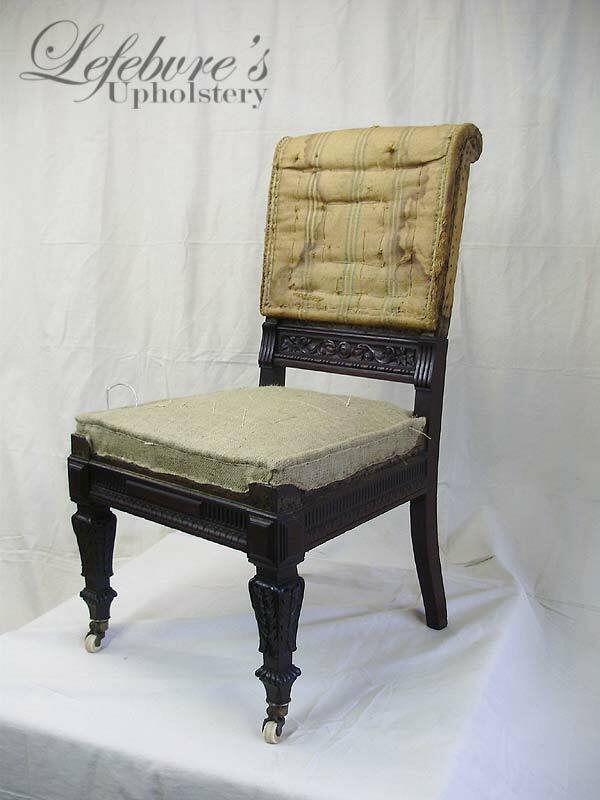 The chair is in a Revival style, and would date from around roughly 1870-1890. 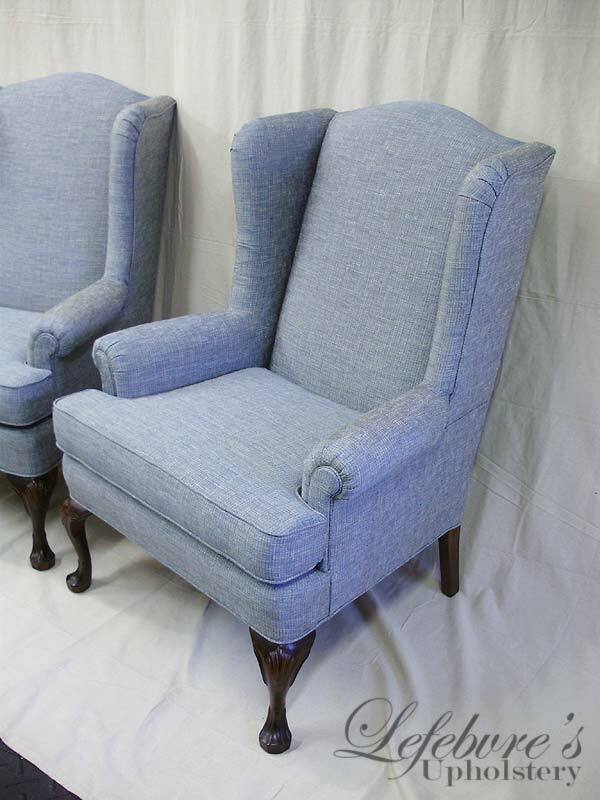 As far as we can tell, this wing chair is made by the Coombe Furniture Company around the 1950s. 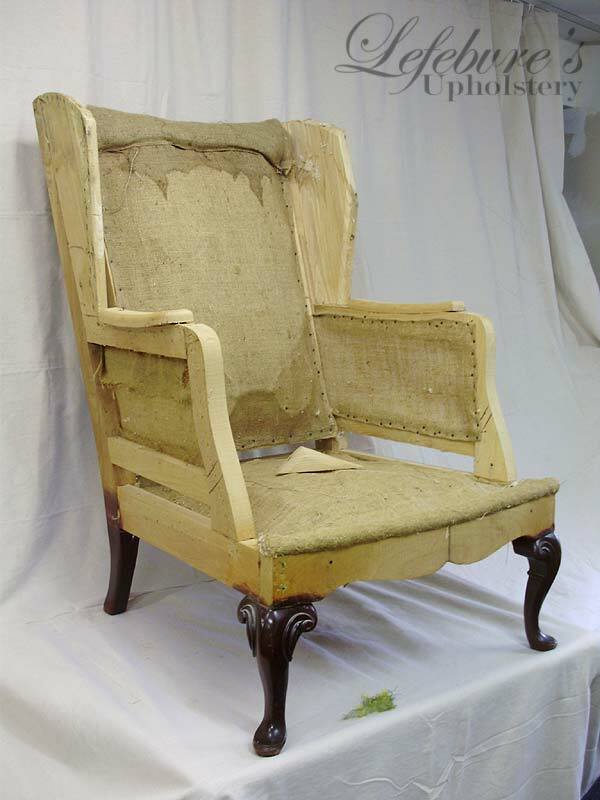 Coombe was a well known company that made high quality pieces, and their chair frames were made in Elm (as this one is). 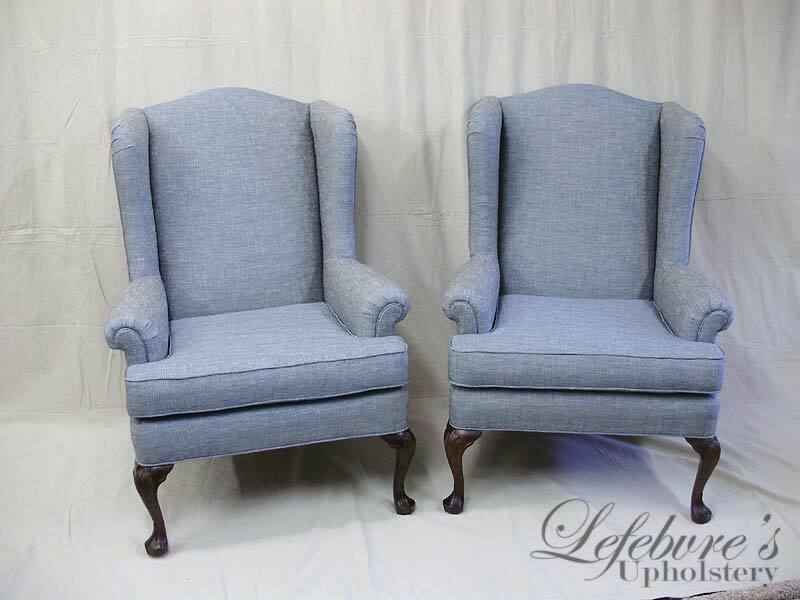 I was able to find one other example on the web that had identical legs. 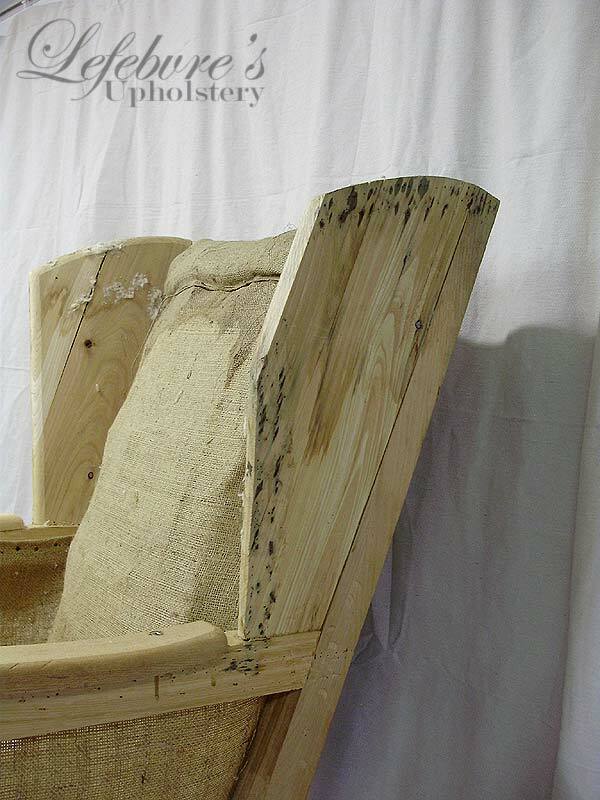 This chair was a bit more of a challenge to work on, since the chair arrived to us as a stripped frame. 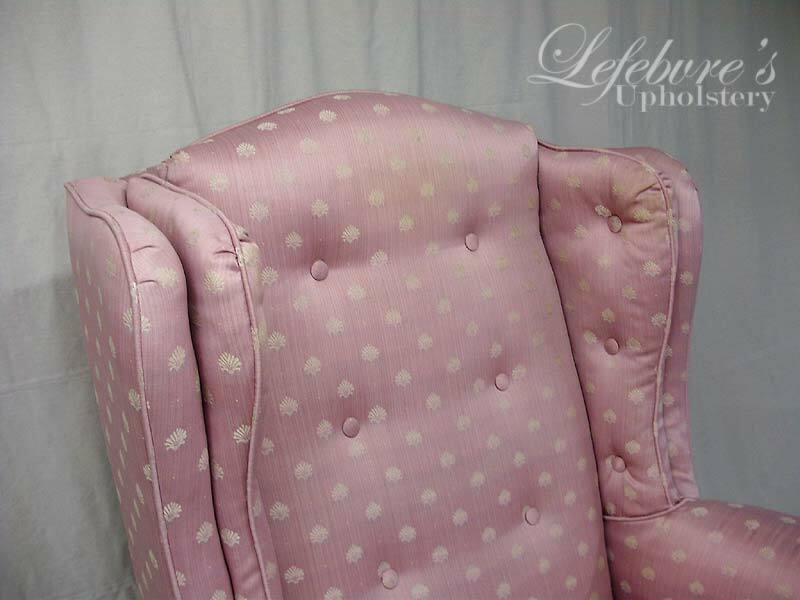 This meant that we had to redo the stuffing and create new patterns from scratch. 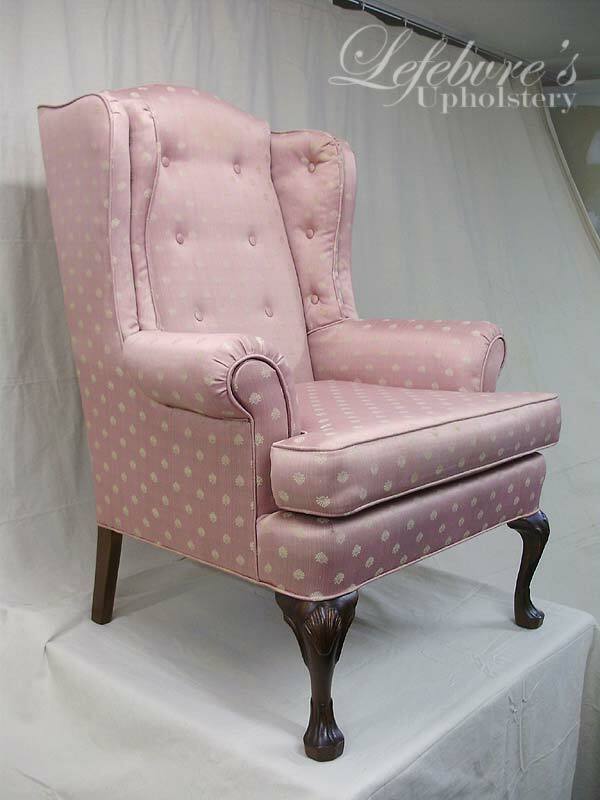 The chair also needed a few pieces repaired. Both wing tips were damaged (and loose on the frame), and one leg (the right one) was completely detached. 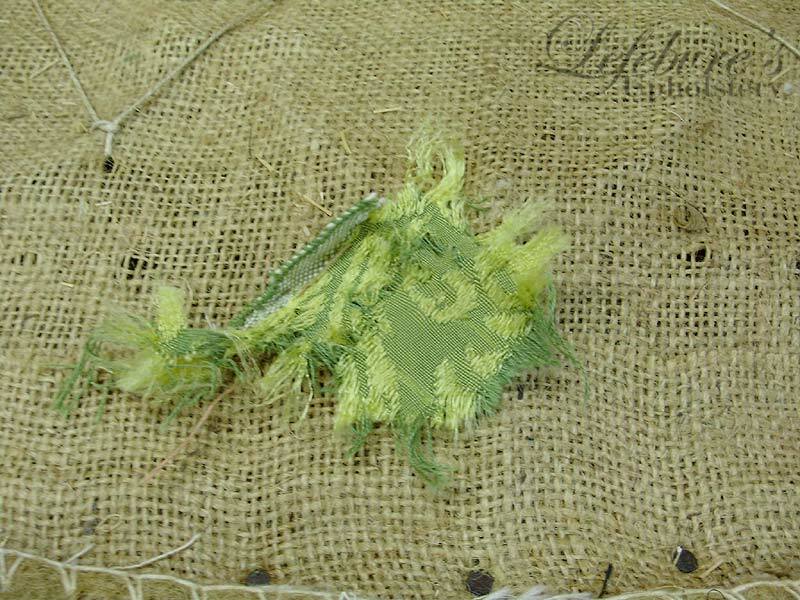 This small scrap of light green and yellow fabric was likely the original fabric on this chair (it was found under a piece of webbing). 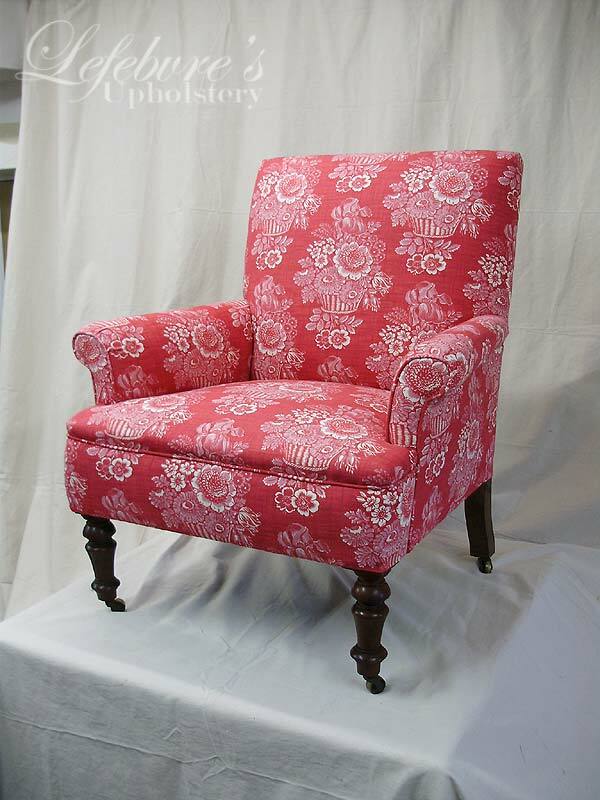 The finished chair! It really came out well. I especially like how the arms and wings look. Very crisp details. 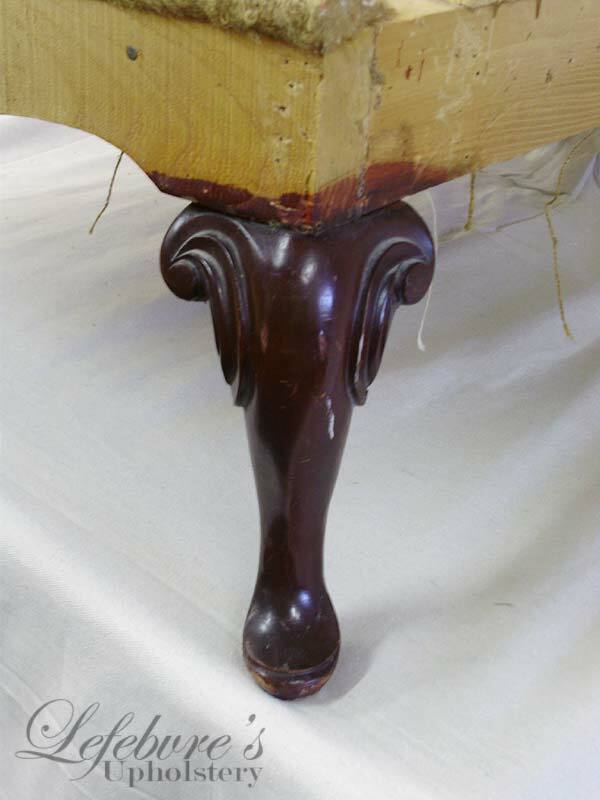 The legs were touched-up (to remove scratches), and given a wax polish. 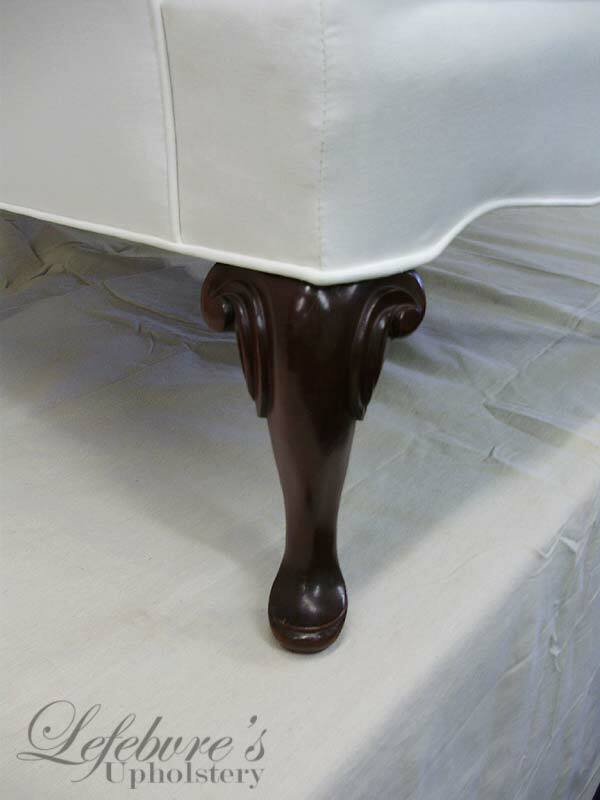 This piece is likely from the 1920s or 1930s (it's difficult to date accurately since it is such a simple style). The bottom was SLIGHTLY collapsed. 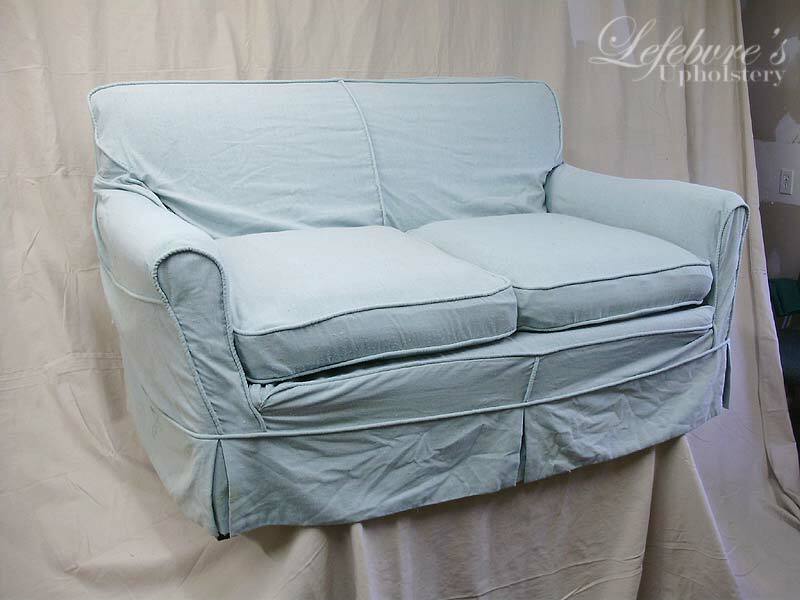 Before I continue, let me just say: this sofa needed "the works". Everything had to be redone on it. 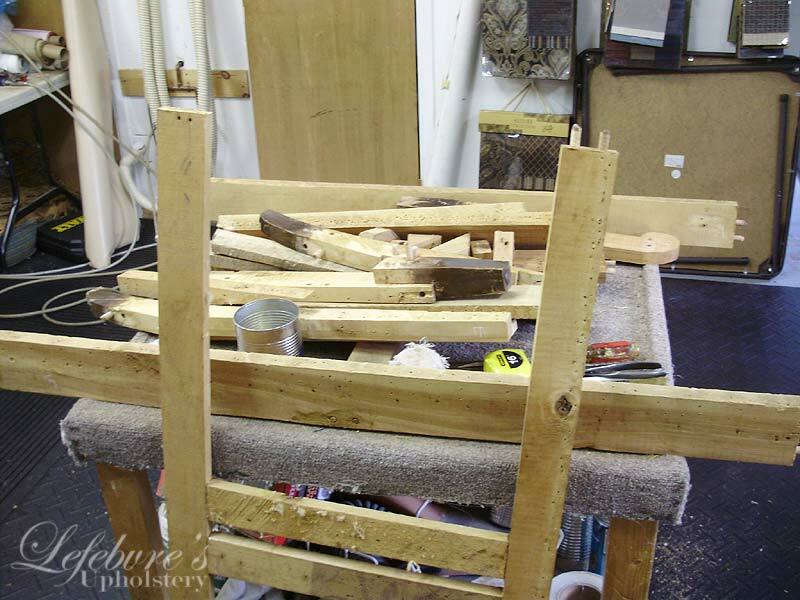 It had to be stripped down, disassembled, glue joints scraped, sand and refinish the legs, and then reassemble the frame. 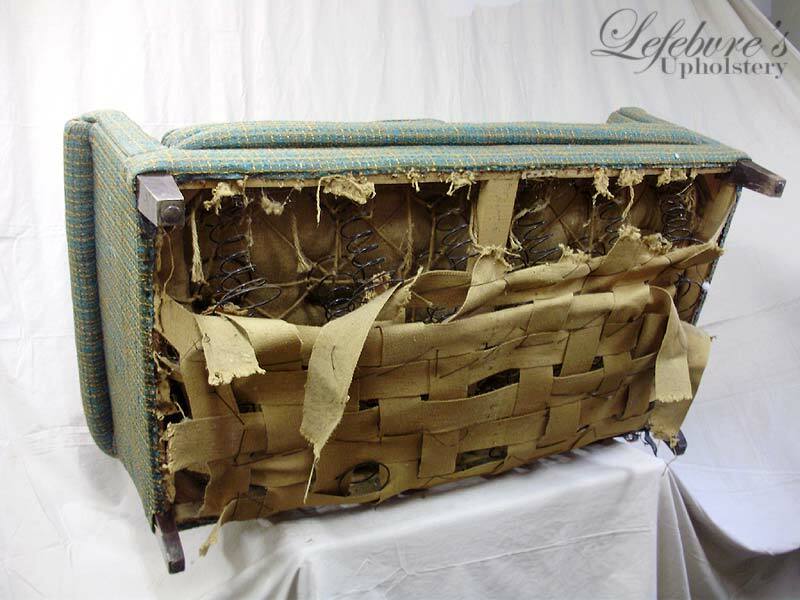 After that: new webbing, re-install the springs, retie the springs, new burlap, redo the berm (edge roll), re-web the back, reattach all the stuffing, and then reupholster everything. It took a lot of work, but I think the finished piece is gorgeous! Alright, lets continue. 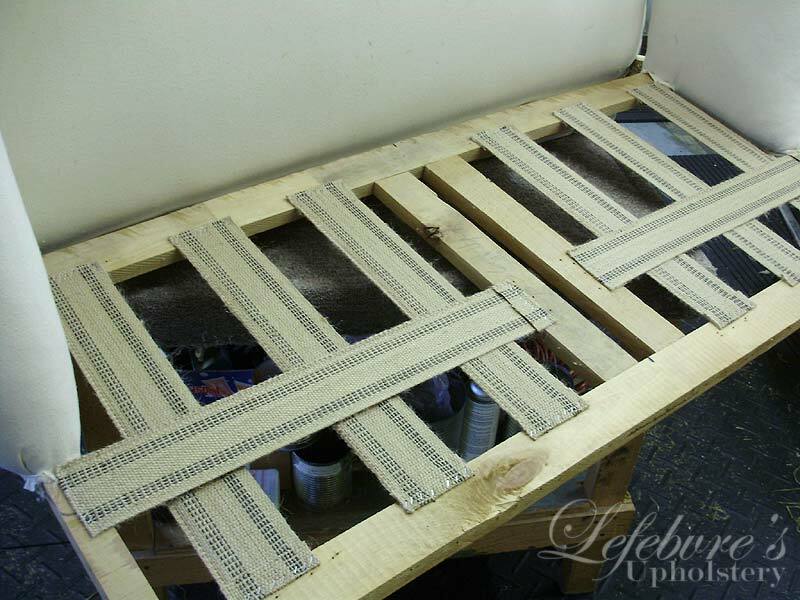 Here's the frame with most of the stuffing and springs removed. Note the sagging rear straps, and somewhat loose side panels (arm tops are stuffed with straw). Frame completely knocked apart (except for two larger H sections that were still solid). 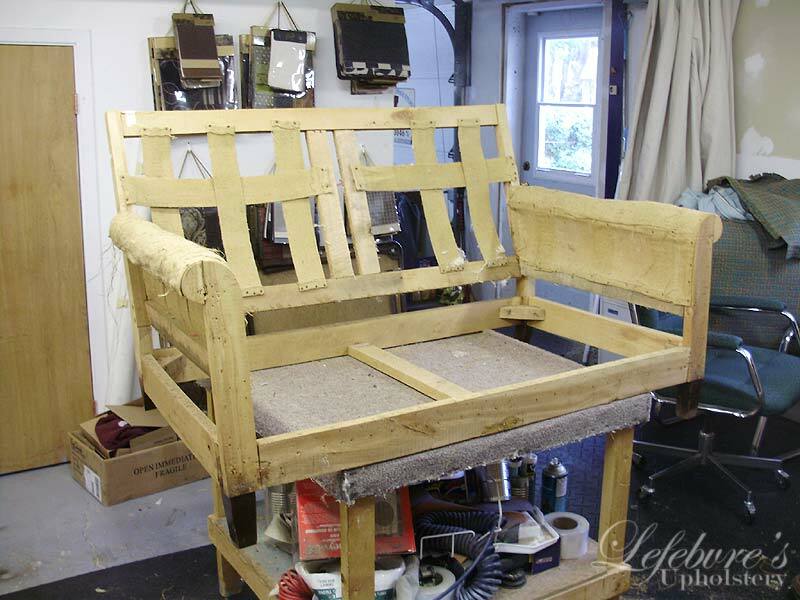 Frame after reassembly, and ready for upholstering. 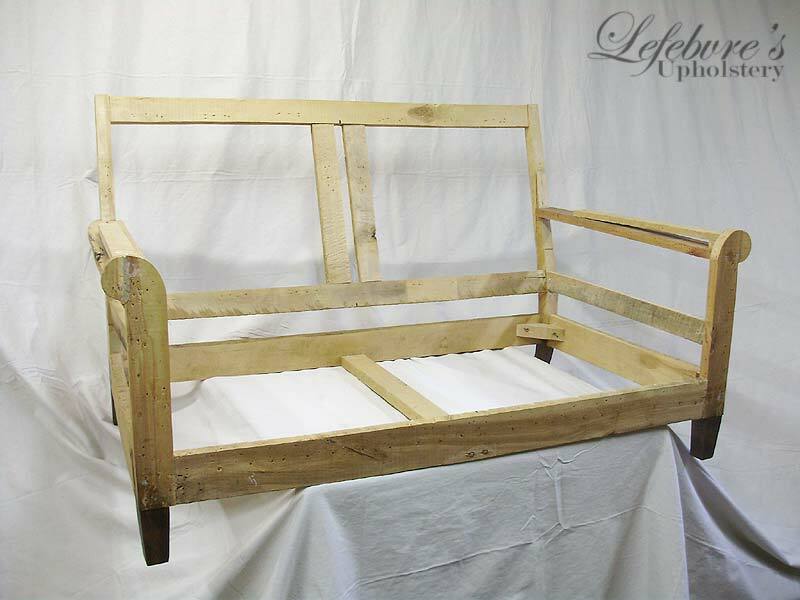 And yes, that's all there is to an average sofa frame (new or old). New webbing. I love doing this part. There's something rewarding/fun about stretching and tacking the webbing down. 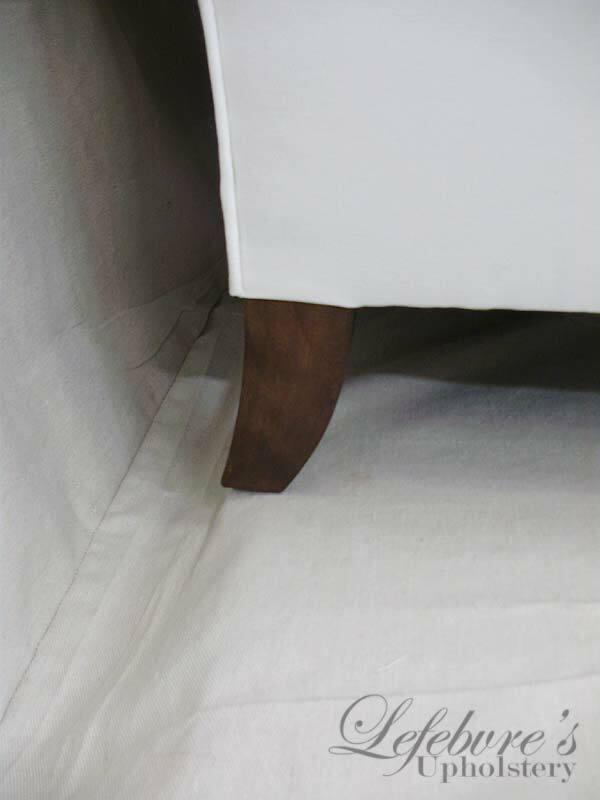 Most newer sofas and chairs have "no sag" (zigzag) springs, but usually coil springs are better (because of how they're attached to the frame on both the top and bottom of the rails). Tying the springs. Not a fun part. The string is very hard on the hands and there are a LOT of knots involved. This is what's known as "eight way hand tied". 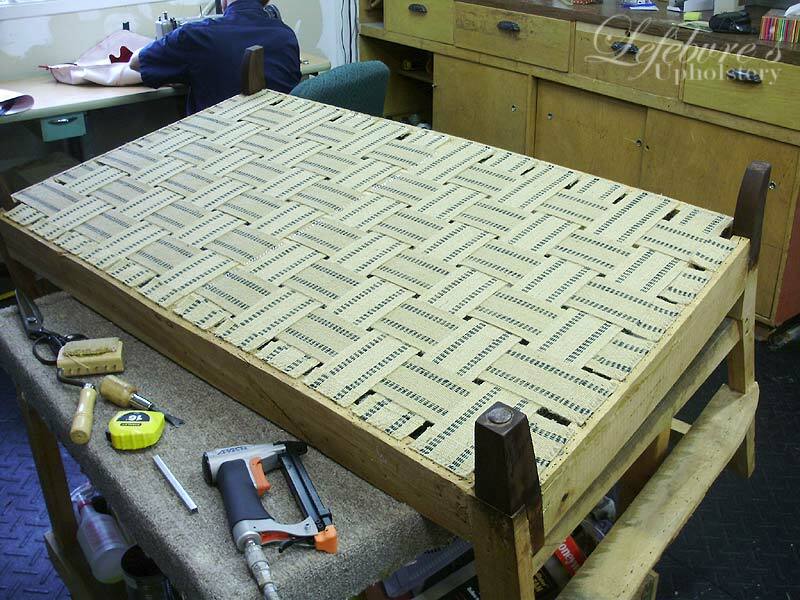 Deck and arm pre-covers done (a rough fabric cover to help contain all the straw and horsehair that made up the original stuffing), and new webbing on the back rests. Also note how the back of the frame is divided in two sections. 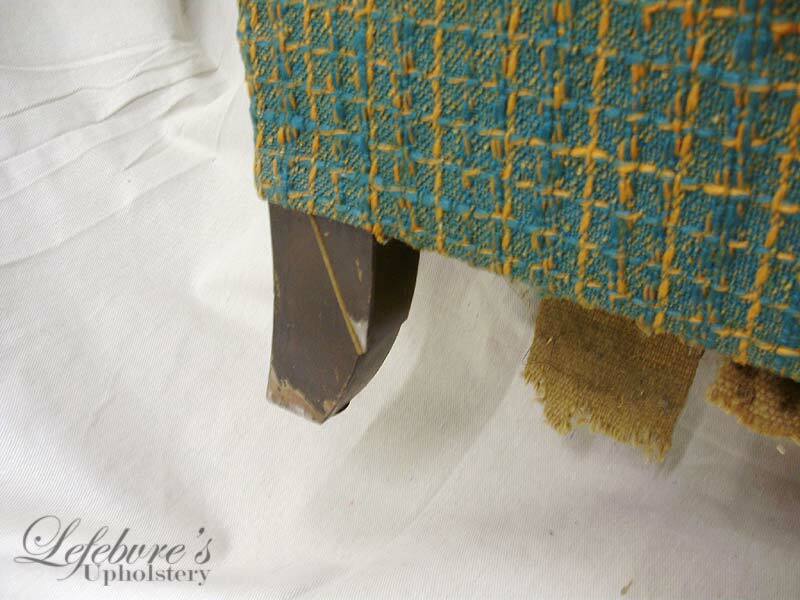 This is because the original sofa had a double "attached cushion" on the back as you'll see on the finished piece below (compare with the photo at the beginning where they had eliminated this detail). 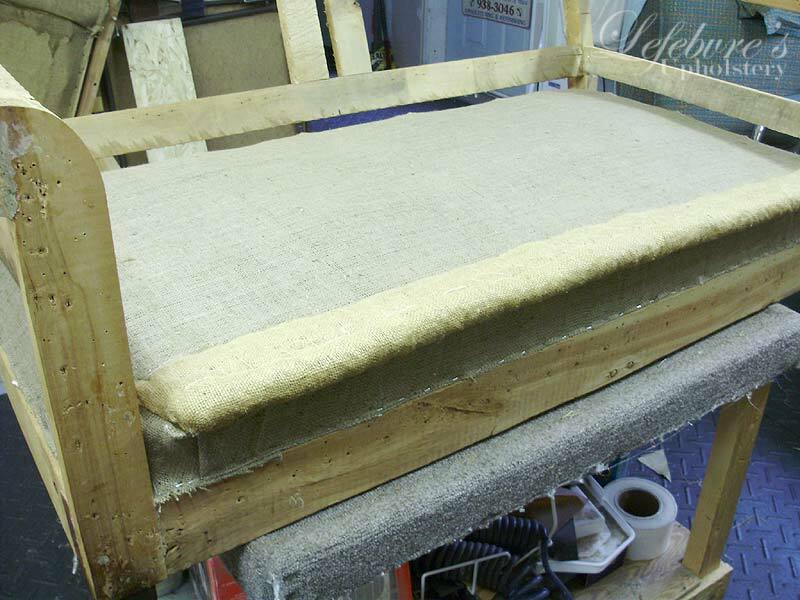 Better photo showing the rough covers, and the back rests with new burlap. 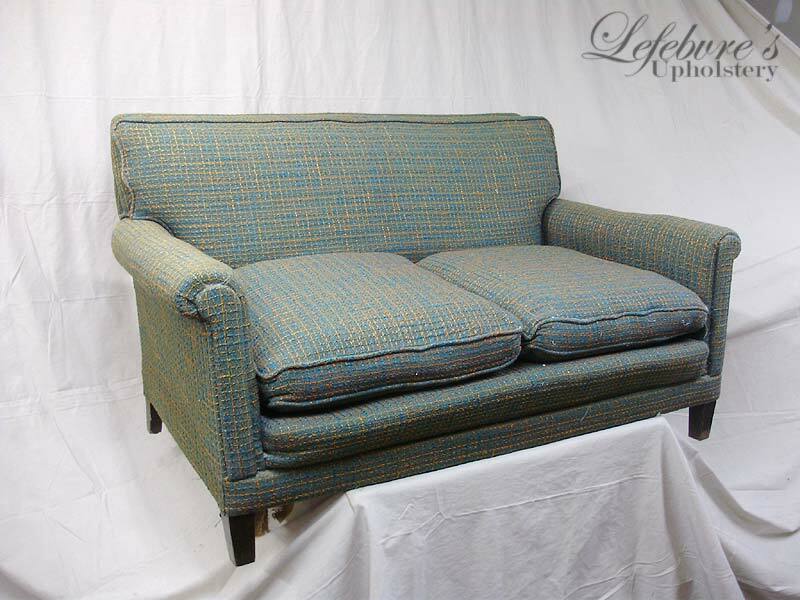 That's it for the "in progress" photos, so here's the finished sofa! 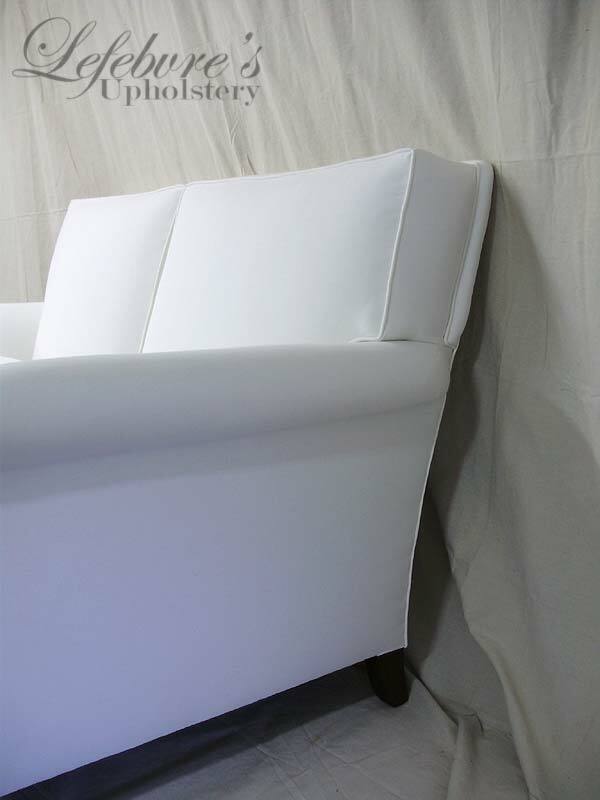 I love the shape (narrow arms, and square pillows). 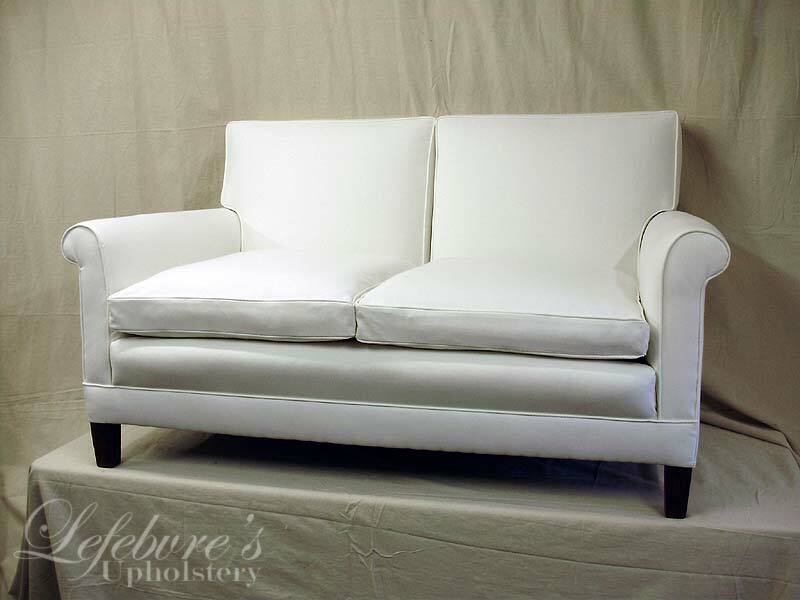 I don't think I'd ever want to have a white sofa, though. While I worked on this, I had to wash my hands about every hour to keep from getting the fabric dirty (which was almost like an ultra-white denim type fabric). 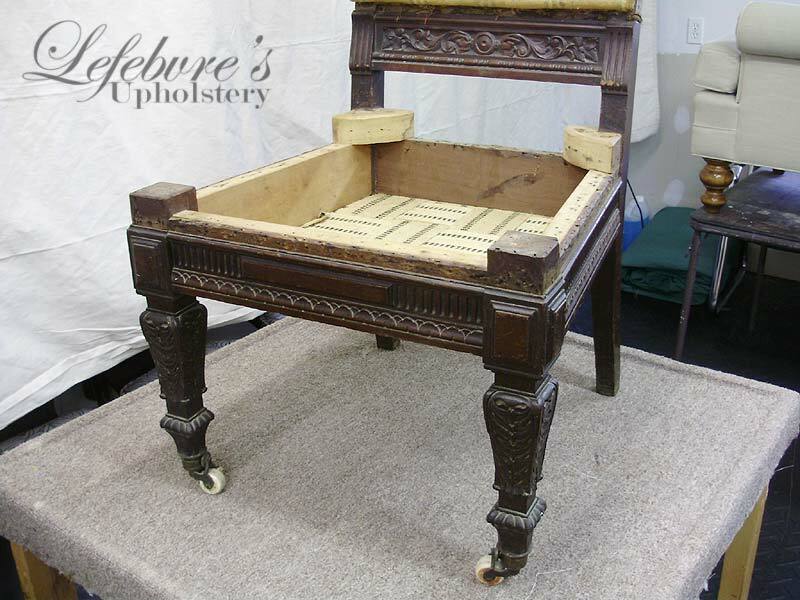 Also note that the seat cushions are slightly domed since they are the original spring cushions (basically they have a mini mattress type box of coiled springs inside them, wrapped in cotton padding). 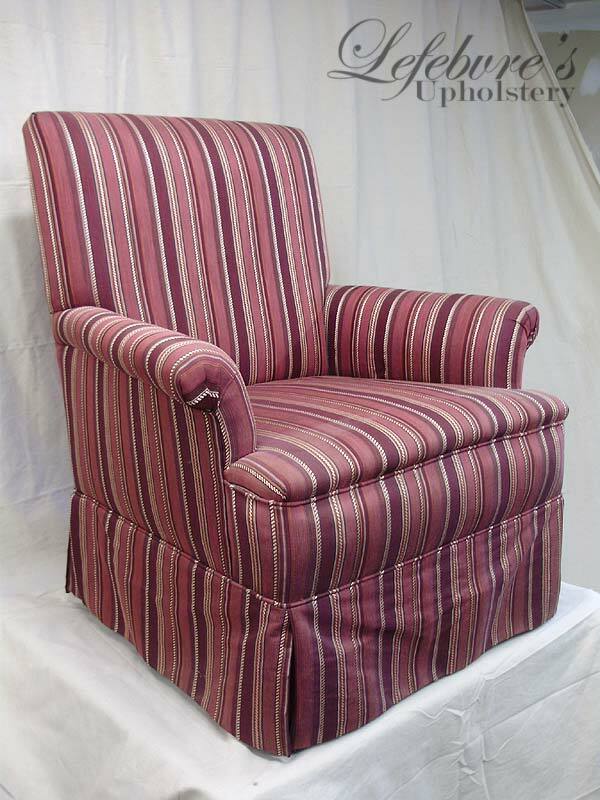 A lot of times these get replaced with foam cushions since they are often more comfortable, but the owner loves antiques and prefers things original. I didn't actually try sitting on the finished sofa, so I can't really say how comfy they are. 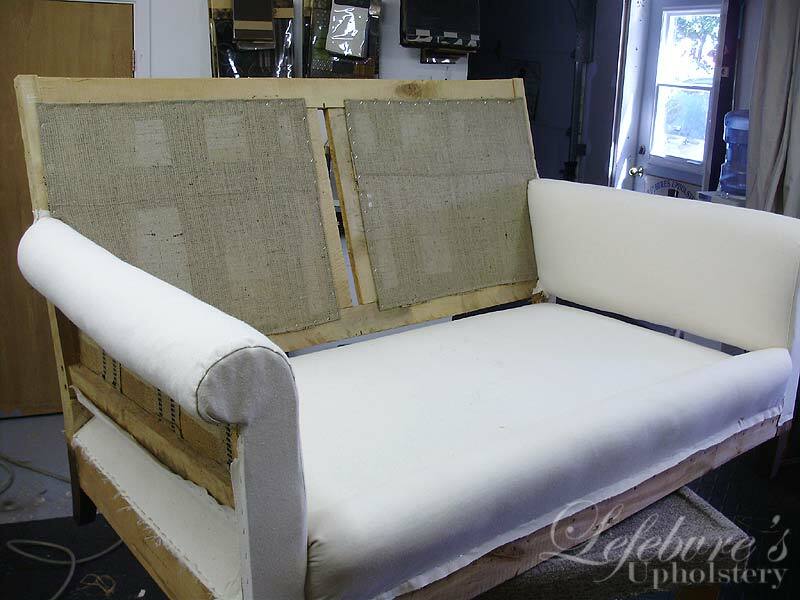 Apparently the sofa won't be getting much use, and will be more of a "show piece", so it's not a big issue. 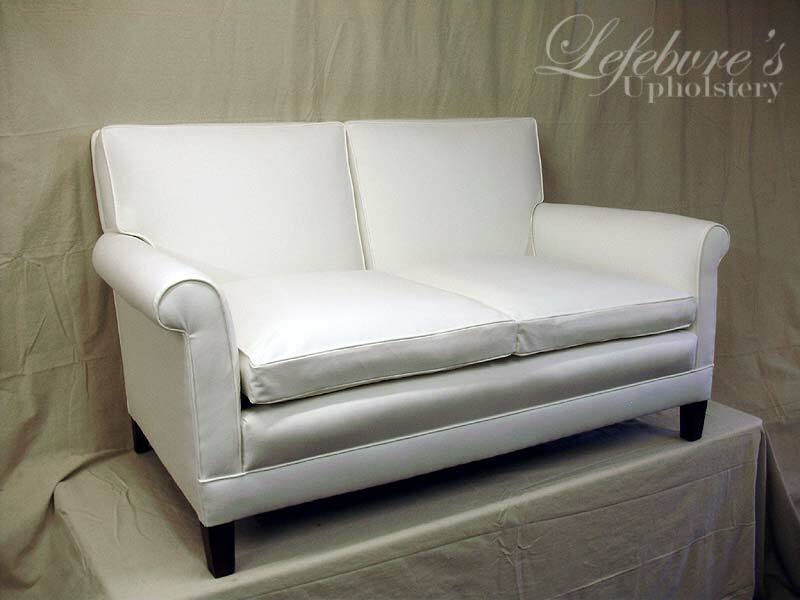 Note how the back cushions look like regular loose cushions, but they're attached to the frame. 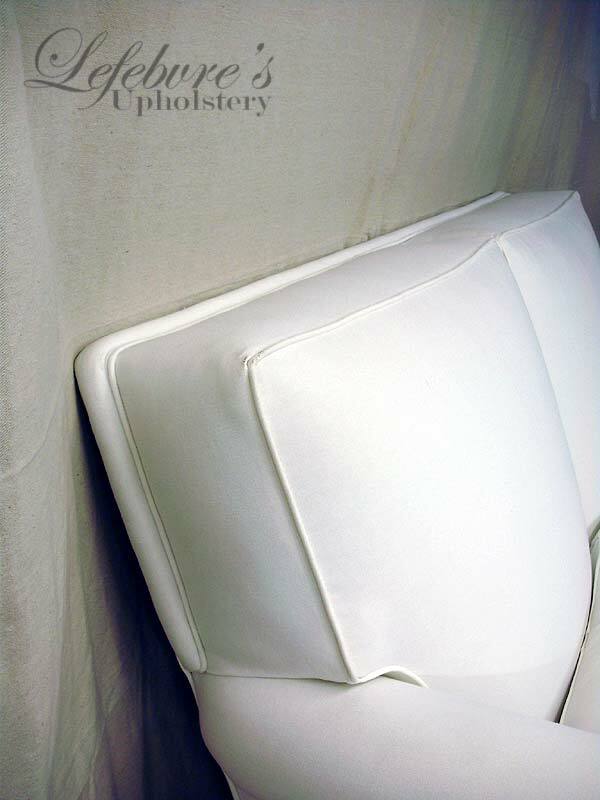 The back has a very interesting detail where there is a huge 1 inch band of piping that follows the contour. 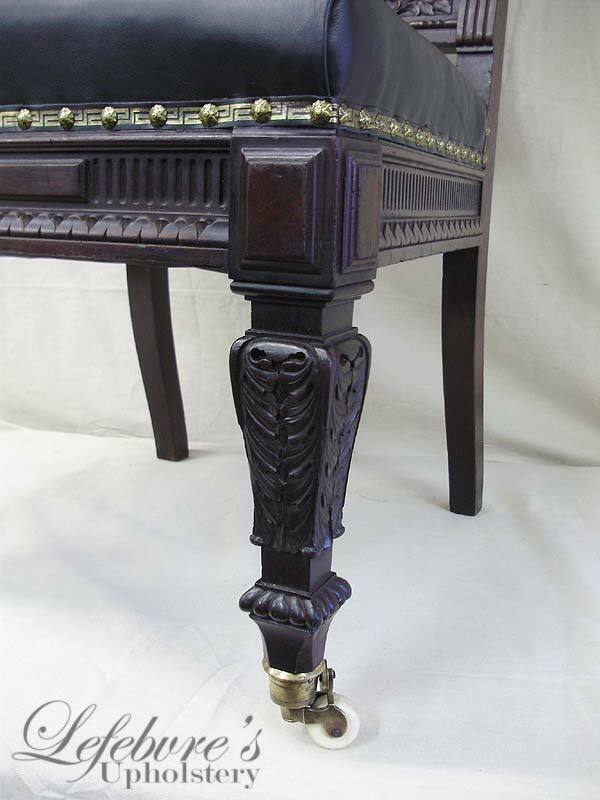 It's a detail I haven't seen very often on other pieces.